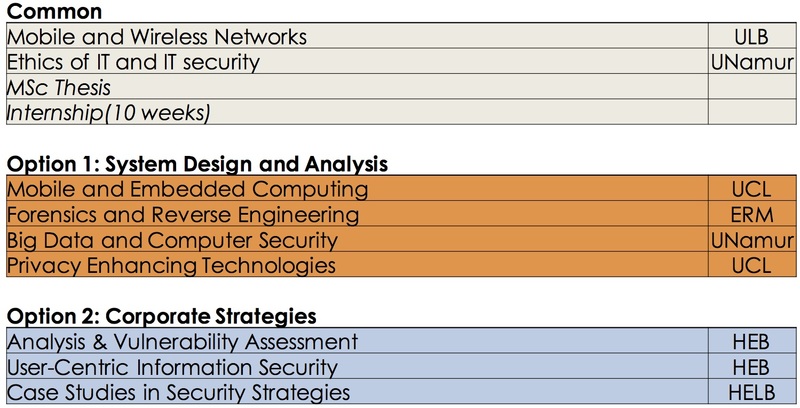 Looking for an Academic Degree in CyberSecurity ? Two years of University courses accessible to holders of a Bachelor in Computer Science, Bachelors in Engineering. Also open to IT Professionals and as a second Master. Personal involvement and self- learning of the students through several projects. Also, a significant part of the competences is acquired during the mandatory long-term internship in the industry (typically 12 weeks). The first bloc of the program is dedicated to building a common body of knowledge. Several seminars and optional courses (10 credits) allow to have an up-to-date and living program. When may I apply ? Is it an evening programme ? No. It is a full University degree. It is thaught 5 days/week and during the day (8:00-18:00). In what location will the courses being thaught? The lectures will be given in 3 different cities (Brussels for ULB/ERM/HEB/HELB, Louvain for UCL, and Namur for UNamur). Student spend a whole day on a given campus or city. When does the Master start ? Lectures will be starting in mid-September. What documents / letters / templates do I have to submit? The relevant documents will be requested as part of the online application. I have a Master in IT and/or I am an experienced professional. What exactly will be my courses allowances when I apply ? It depends. During the application you will submit the list of courses you followed in your previous degree. The jury will then determine the courses that can be removed (allowance) from your cursus in this Master. Would it be posible to spread the cursus over more than 2 years ? Definitively. Each successfuly passed exam yields the credits for that course. This credit is acquired with no limitation in time. In what language will the courses be given ? As of today, courses are 90% taught in English and 10% in French (legal and ethics). English speaking applicants will have the opportunity to substitute the French courses with English ones. (*) All apllications on record. Valorization of professional experience may vary. All applications will be reviewed by the academic jury.